Cai! It’s great to have you back. Can you summarize the purpose of this conference? Why was it important to you to participate in it? Science Fiction and Fantasy is such a huge part of our world and our upbringing and it has the potential for so much more than we realize. We are born hearing fairy tales not realizing that those fairy tales did and still can have relevance to our everyday lives. We use fantasy stories to teach kids, manners, trust, respect and then we stop. But what if we continued? 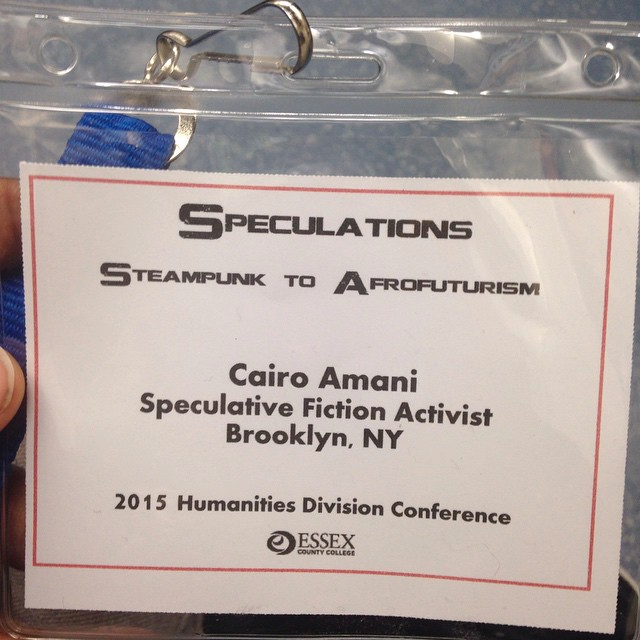 The conference asked us as readers and artists to rethink the implications of Speculative Humanities–and we absolutely should. I love those points about how, at a certain point, we stop using fantasy to teach and to socialize youth, as well as to deal with important life questions. I believe childhood that thirst for the fantastic never really goes away, and that we continue to seek it in some forms throughout our lives. How did you go about getting to be a speaker? Most events have a “Call for Papers”. I try to do a search for calls weekly, to see if there are any that pertain to speculative fiction, that are open (no membership required) and where my subject matter may fit. Then I send in an abstract, which is a short summary of my presentation. Then I wait–because so much of writing is about waiting. How did you manage your nerves? I am not sure I ever did. I went with friends, I called my best friend on the phone just minutes before the panel began–and then I made the audience laugh. Throughout my entire career my plan has always been to make the audience laugh. When you open with a joke the crowd is ready to trust you–when you laugh with the crowd, you become ready to trust them. How does speaking at this event fit into your long-term writing goals? My ten-year goal is to be a professional scholar–meaning I’d be completely self-sustained by writing, teaching and public speaking. Writing queer people and people of color into mainstream stories is my form of activism. But those stories tend to be less popular on shelves. Meaning, I have to work twice as hard to find a place for my stories, to make a place for my stories. Public speaking allows me to show people that there is a need while also inspiring them to fill the need–so I’m not the only one. After the whole thing was over, there was a luncheon for all the speakers. I feel like it’s super rare that I get to sit around a table with a bunch of other Nerds of Color and talk shop. It was exhilarating! What was the essence of what you spoke about? 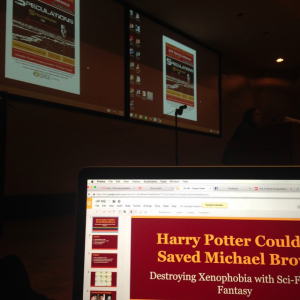 My presentation “Harry Potter Could’ve Saved Michael Brown” addressed how more diversity in children’s literature could lesson Xenophobia as those children grow to be adults. It also touched on how diverse literature that already exists could easily replace the texts we do read. Message to our readers today? Life isn’t Tetris, there’s not always going to be a place for you to snuggly fit yourself. But don’t let that discourage you. Think about where you want to be and then create that space. Don’t wait for people to realize they need you–show them they need you. Then be present. … … ‘life isn’t Teris’. Love that. How can readers contact you to learn more about you and your future activities? Please visit my website to shoot me an email. There is also a “Find Cai” tab-which leads you to my calendar. http://www.cairoamani.com. I hope to speak to you soon. Thanks for checking out Cai’s incredible experience. Please leave Cai a message below and/or go check out her website and drop her a line there. 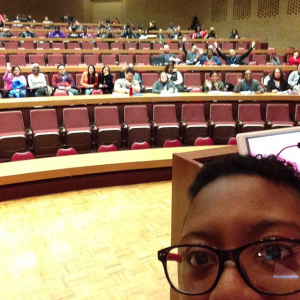 Also, she is speaking at an event this weekend called: AFROFUTURISM | Conference: Designing new narratives to empower the African Diaspora. Check out the Facebook page for details!